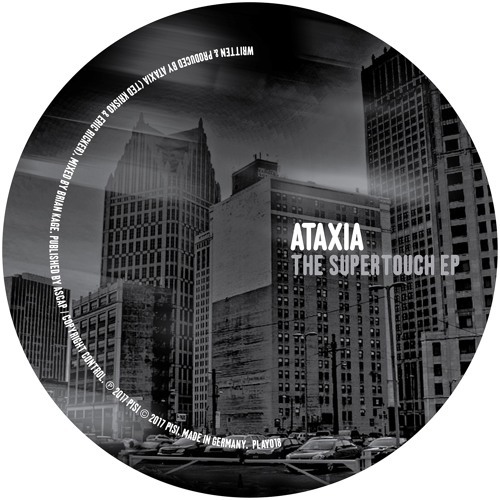 Seth Troxler's agenda setting Play It Say It label is back with more summer heat, this time from American duo Ataxia. Hailing from Detroit, this pair have recently played the famous Movement Festival in their home city for the fifth time, work with top labels like Nervous Records and Culprit LA and have already impressed with a fine EP on Leftroom this year. Their sound is designed to get the party started, and after already releasing on this label in 2016 they are now back with three more essential tracks. Up first, the terrific 'Time Original' is a fluid and wriggling tech cut with busy synth lines scurrying about over driving drums. It's dark and freaky with poised chord stabs and the whole thing cannot fail to get floors moving. Then comes 'Supertouch', which is a superbly slick acid number. Weird bleeps and clipped vocals add an unhinged edge to the urgent rubbery drums and the whole thing is a mind melting number that will take any set to the next level. Last of all is the vital 'Villains', seven inventive minutes of gurgling bass, alien sound design and wonky synth lines that all warp around each other and melt your mind as they do so. Colourful and full of character thanks to a rapped vocal line, this one is a real party anthem in the making. Across all three cuts here this talented duo really show off their wide range of studio.